Allow your customers to call for service directly from the comfort of their sunbeds, deck /pool, beach umbrellas! The Call from Parasol system is an exclusive service to offer to your customers: it allows the bar/waiting staff or the lifeguard to be tracked from beach umbrellas, chairs or unattended tables. Your staff will be able to provide faster and better service enhancing customers’ satisfaction and loyalty. 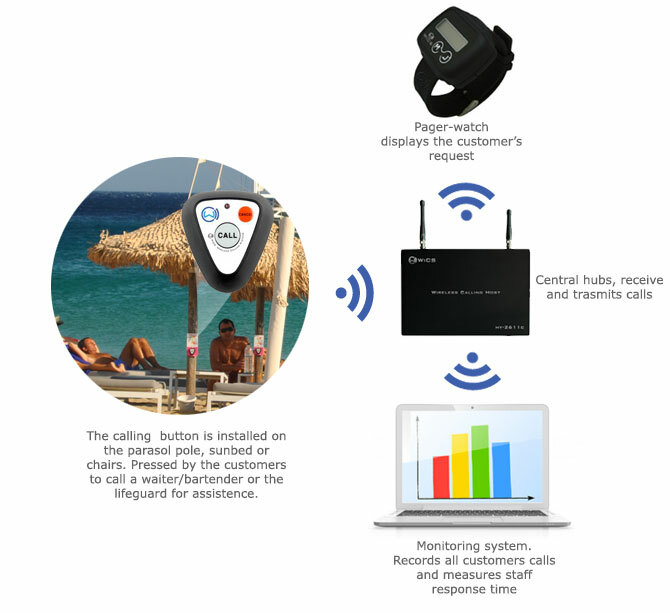 The call button installed on the parasol pole, sunbed and chairs will allow customers to call a waiter/bartender or the lifeguard for assistance: for example to order a drink, something to eat or to request the lifeguard’s help. The waiter/bartender allocated to the specific calling button is notified of the customer’s request: a message is displayed on a pager-watch that they are wearing. (Optional) Our monitoring system, which records customers calls, starts measuring the staff response time and provides real time updates, data analysis and statistical reports, enabling managers to monitor the effectiveness of the organization, the performances and progress of your waiting staff over the weeks. It helps to identify possible resource issues that need to be addressed. More turnover -Faster service means shorter customers’ waiting and consumption time, increasing income for your establishment. Enjoy more orders and efficiency, leading to more revenue. Our clients have reported an increase of approximately 18%! Reduce number of staff - Be able to handle larger areas with less staff. Improve waiter’s work efficiency, reduce number of persons needed. Quicker response times – Improve your staff reaction times and never miss out on an order. Hidden areas can be serviced instantly without the constant need for waiters to be present. Improve customer service – In order to be served customers only need to press the calling button, without having to look for a waiter and then frustratingly having to try to catch their attention. Waiters can receive calling information promptly on their pager-watch and provide timely service without interruption. Customers are more relaxed and satisfied. Simplicity - Extremely simple to use, no wires and minimal running expenses. Waiters’ pager-watches can be programmed only to respond to calls from designated areas/beach umbrellas/sunbeds/etc., preventing more waiters responding to the same call. WiCS® is the leading supplier of wireless technically advanced service enhancement solutions. We are based in London and operate in UK and Italy. We supply our systems to chains and independent hospitality and leisure venues, global retail and manufacturing companies, restaurants, cafeterias, pubs & bars, hotels, SPAs, banks, hospitals & nursing homes, supermarkets & shopping malls, casinos and health clubs. Copyright© 2014-2019 WiCS®-Wireless Calling Systems Ltd.